Johansen’s Pool Service, Inc is a pool and spa maintenance company with as many as 15 technicians working full time to maintain pools in Washington County communities. We are certified to maintain commercial properties by passing the Aquatics Facility Operator test. Our technicians are trained to clean the pools, check and balance the chemicals, inspect the systems and the equipment , reporting to the office any repairs that the homeowner should be aware of. We service about 500 pools in the county year round. 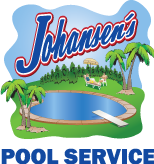 Johansen’s Pool Service, Inc. performs all types of repairs. We repair or replace pumps, filters, heaters, automatic covers, O-Zone systems, ORP Systems, solar systems, etc. Our experienced repair staff has over 90 years of combined experience in the repair business! Our staff is well trained and we attend regular training sessions taught by swimming pool manufacturers to stay abreast of the newest products and how to repair pool equipment. Dedicated office staff take your calls immediately and promise to keep you apprised of their resolution. These experienced men & women bring over 50 years of combined customer service experience to Johansen’s Pool Service, Inc. They are courteous and respectful of your concerns. Customers call with confidence knowing they will be heard and responded to in a timely manner.